As the temperature starts to drop into hibernation territory, your first instinct might be to hop a plane to the nearest tropical destination. 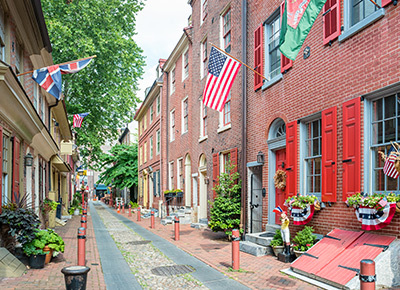 But don’t bust out the flip-flops just yet: These charming escapes—all within a few hours’ drive of the city—might make a winter believer out of you. This recently opened Catskills property is a “choose your own adventure” of sorts: Opt for a well-appointed hotel room or go semi-rustic with a Scandinavian-style A-frame cabin that comes with access to an outdoor wood-barrel sauna. When we dream about having our very own reading nook, this is what we picture. And it happens to be inside renovated 18th-century country estate where Mark Twain, Ernest Hemingway and Ralph Waldo Emerson once stayed. Opened by two friends who worked in NYC publishing in their former lives, this pet-friendly Catskills retreat boasts gourmet farm-to-table breakfasts and vintage furnishings for sale (should you want to take a piece of the charm home with you). We don’t know how we got through January without a personal fireplace before, but we don’t intend to do it ever again. There’s nothing like admiring the snow from your own private hot tub. If you’re looking for a place to get deep into a new book, we think we’ve found it. This is what we call peak hygge. This upstate favorite is convenient to Hunter Mountain, but we wouldn’t blame you if you wanted to skip the slopes and go straight for the après-ski menu of hot pretzels, crab dip and a burnt-maple old-fashioned. Looking to get out of town with your squad? This cabin sleeps eight and boasts magical lake views. That would be the town of Red Hook upstate, not the Brooklyn ’hood. And this eclectic spot is in an actual converted barn. Seriously, it’s painted red and everything.